Turn on, Plug in but don’t Chill Out on winter’s long road. 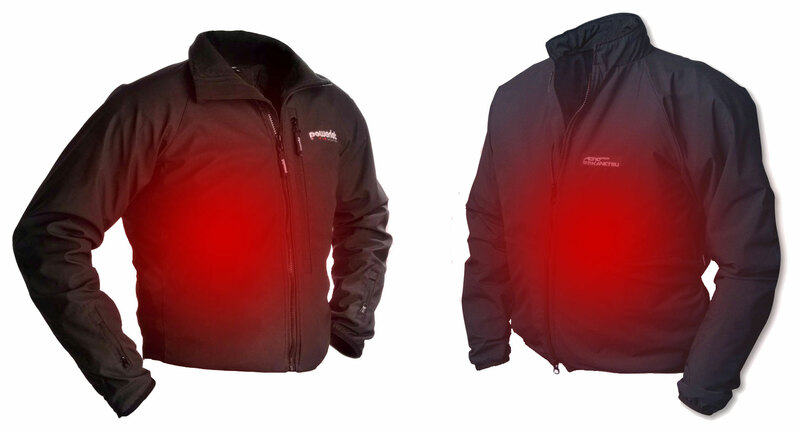 If you live outside the tropics and like to ride on anything other than sunny summer days, heated clothing makes sense on a bike. Your bike produces excess electrical power which, with the benefit of modern technology and materials, can make a near-freezing ride tolerable in a way you couldn’t imagine. The two jackets looked at here are Aerostich’s 75-watt Kanetsu AirVantage (above, on the far right) and the lately discontinued 60/105 watt Powerlet RapidFIRe which you can still find used for as little as £100. 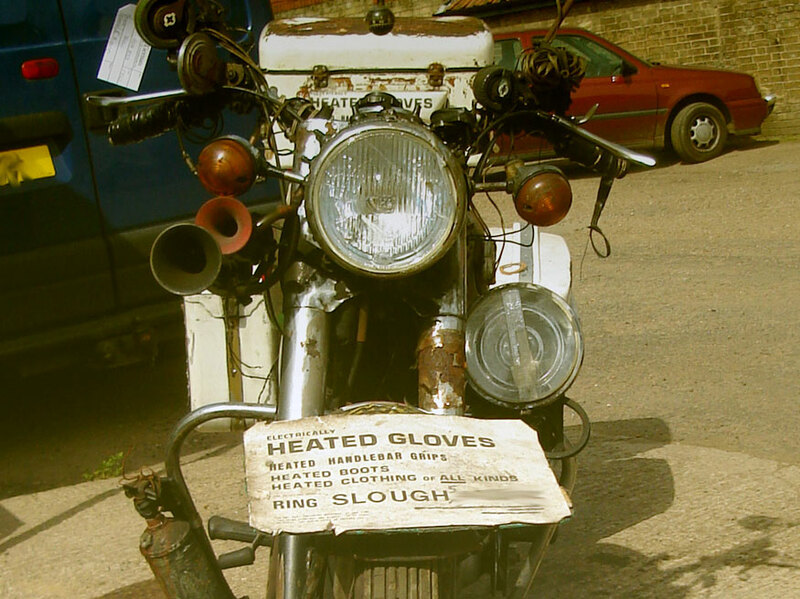 I remember back the late 70s there was a batty guy at work called Maurice Seddon who rode a BSA made before I was born and who sold hand-made heated clothing on the side (left). For London-based despatching that wouldn’t have been such a great idea, as with all the stop-start and on-off you never got that cold. But out on the road between cities you sure could. Even then, heated clothing had a reputation for inefficiency and unreliability and so didn’t seem worth the investment compared to piling on the layers and gritting your teeth. Compared to the northern US states and eastern or northern Europe, the southern UK rarely gets that cold in winter (anymore), but sat on a bike in the wind it’s always colder than you think. Apparently, in bikers’ lore over in the US there’s something called the ’60 60 30 rule’: 60 mph at 60°F (ambient) feels like 30°F on a bike (100kph / 15°C / -1°C). That may be easy to remember but is clearly exaggerated. There’s no way doing 60 at 15°C feels like just below freezing. It’s an embellishment of what they now call the ‘old wind chill index’. 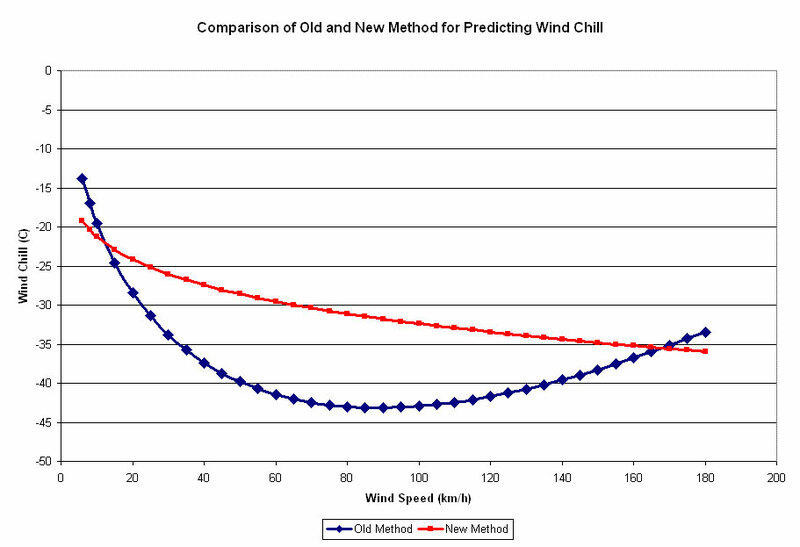 According to the calculator on this page, the post-2001 new wind chill index (NWCI, red, left) gives a more plausible index of 54°F or 12°C, rather than 30°F at 60-mph. Bright sunshine can also reduce the wind chill by several degrees °C. But when the ambient temperature drops to a more typical, mid-winter’s ride of 41°F (5°C), the new wind chill index corresponds to 26°F or -3°C. That’s how it felt for me crossing northern Spain last week when, for the last few hundred clicks to Santander, the road rises to more or less 700m (2300′). Though it was foggy and clearly above 0°C, I felt freezing with my Powerlet RapidFIRe heated liner turned up to the max. 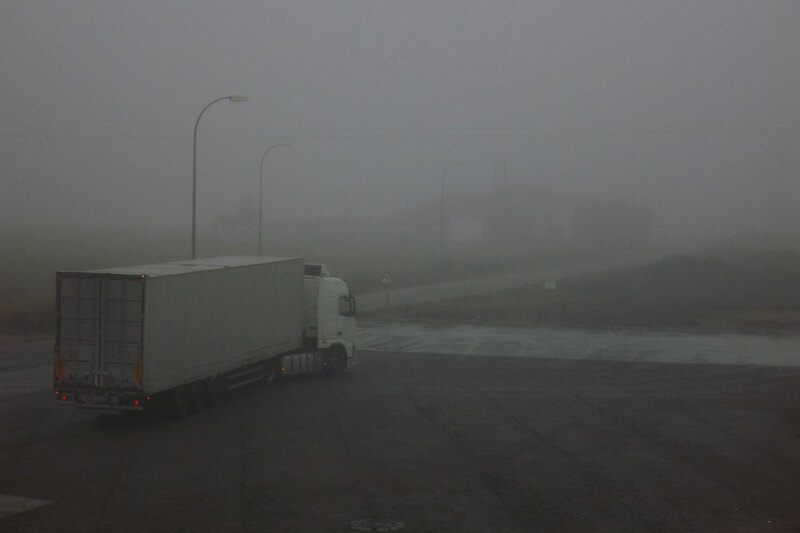 I rode on through the murk for as long as I could bear it, then dived into a roadside hotel to thaw out. Next day it was the same until I dropped out of the fog to the coast. It gave me time to work out how to get the best from a heated liner. Apart from sealing against all possible draughts, using heated grips, hand guards and a wind shield, having the liner actually pressing on your body is much more effective. Like this, the liner’s heated matrix is warming a thin base layer clinging to your skin, not the air gap between. And ironically, I feel it’s better of that base layer is not thermal – just thin polyester or whatever that’s easier to wash than a jacket full of wires. At times I was riding with my left arm pressed against my chest just to force the front on the jacket against me and benefit from the heat. But doing that for a while my hand got cold away from the heated grip. Next day I wore a thin fleece over the jacket to press the wires down achieve the same, all round effect. The Kanetsu is designed to zip in as a liner on your Aerostich Darien or Roadcrafter, but over the years I’ve mostly used it with various other jackets. 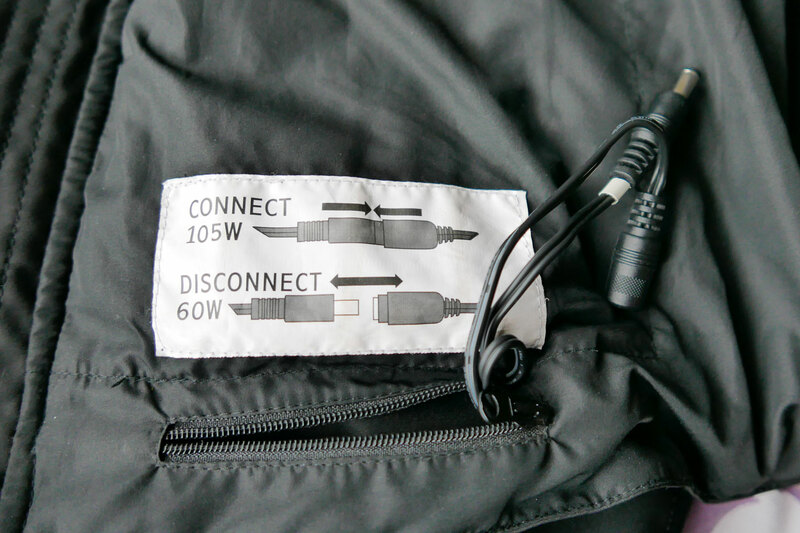 The Powerlet zips up to itself, but does feature a textured outer shell that’s slightly tacky or rubbery so it’s more prone to staying with your main jacket as you slip both off (assuming that’s what you want). Because the Kanetsu is a zip-in liner, I found when using it with other jackets the open-ended zip would open up from the bottom. Aero could get round this by adding a stud to stop it separating when not zipped in as a liner. Both jackets stuff into their own zippered pouches (left), with the Kanetsu benefitting from belt loops. On a long trip both still add up to a sizeable bulk when not worn, unless you choose to use it off the bike. As you can see below, they both look pretty good as regular jackets. 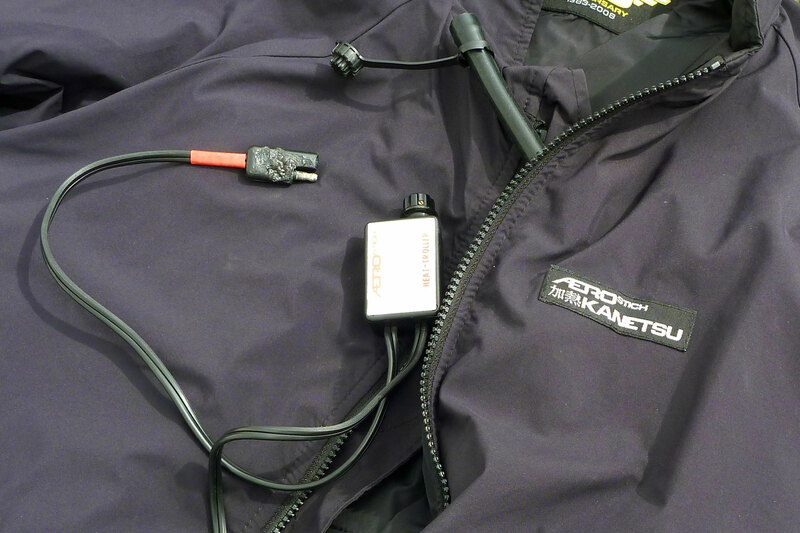 The Aerostich has more pockets, the Powerlet has a lined and heated collar. Both weigh about 1100g. As said, a close fit is makes all the difference and these jackets achieve that differently. The RapidFIRe has Spandex panels in the body and arms (left) to make the liner cling to you. Mine was an end-of-the-line cheapie which by that time was only available in XL – a bit too big on me. But it occurred to me I could easily close up those elastic panels with thread to achieve a snugger and so more effective fit. T he RapidFIRe has two heat settings – 60/105 watt which, afaict, the newer $430 Atomic Skin model has dropped. Probably because no one ever needed 105 watts. To activate this arctic setting you join up two loose plugs zipped into a dinky hem compartment (left). Knowing my Honda had the capacity to run it (see below), I tried the 105-watt setting on a 200-mile round trip down to around 8°C (which in NWCI adds up 0.5°C @ 65 mph). I found that setting 2/5 was more than enough to keep me warm in my Darien Light and a thin base layer. If I regularly rode in sub-freezing conditions I might leave it on 105 watts. More probably though, I’d get a car. My 5-year-old 75-watt Kanetsu AirVantage is a version of Aerostich’s regular (and $70 cheaper) WindStopper. 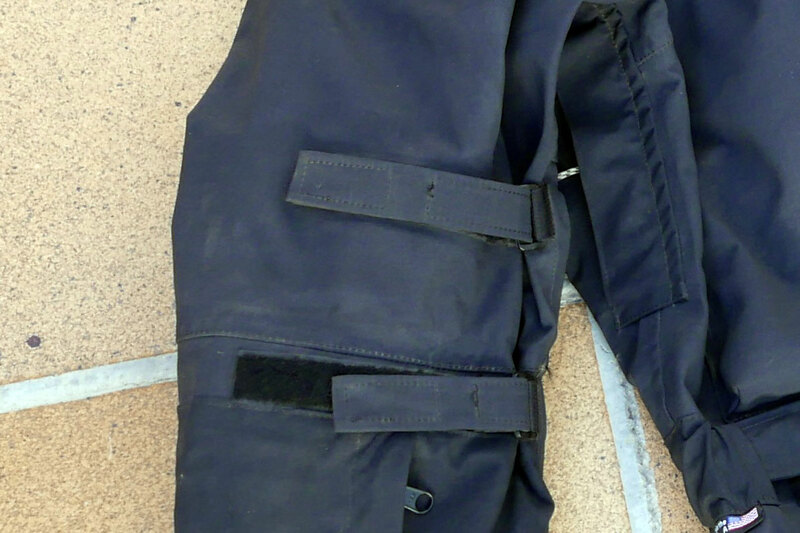 It differs by having an air bladder within the body linings which you inflate with a stem valve (left), like an airplane life jacket, until you have a comfortable fit under your riding jacket. As long as you’re not wearing it inside our (easy mistake to make) the bulging bladders press the heating elements against your torso, a clever idea that maximises efficiency and means you don’t have to whack up the dial for it to have the desired effect. Until you get used to it, it’s another thing to remember to do when togging up, and it can result in that ‘stuffed’ feeling you’re trying to avoid with heated gear. But it adds insulation and does work. 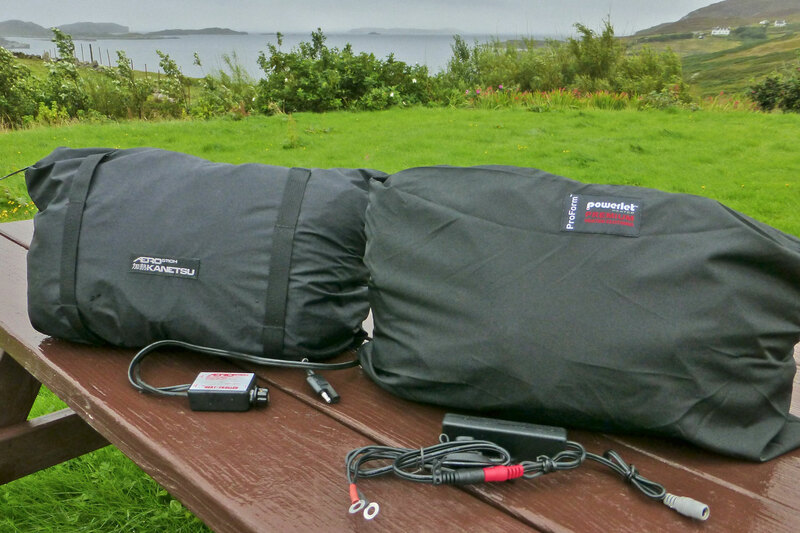 The AirVantage is definitely worth the extra $70 ($387) over the regular, non-inflating WindStopper. What both jackets highlight is that once warmed up and doing their thing, you won’t necessarily feel like The God of Hellfire (right) reposing in front of a roaring log fire with a warm cup of cocoa. But you’ll sure notice the difference should you switch them off. [This is actually a slightly misleading test as switching off is a bit like stepping out of a shower all wet: in the short term you’ll feel chilly until things evaporate]. And, depending on the wind protection on your bike, you’ll also notice your heated but exposed arms will feel notably less warm than your hopefully balmy torso, as well noticing the slightest cold spot. In fact this whole temperature differential can be a bit of a distraction. The Powerlet uses something called Carbon Nanocore technology (thin wires) producing far infrared heat (hence Rapid FIR e); the AirVantage simply uses ‘hotter’ wires in the arms. Whichever one you’re wearing, this is where those velcro arm cinches on your riding jacket come in useful to press the heating elements against you. The Darien I recently reviewed has them both above and below the elbow (right), but they still couldn’t spread the heat evenly. 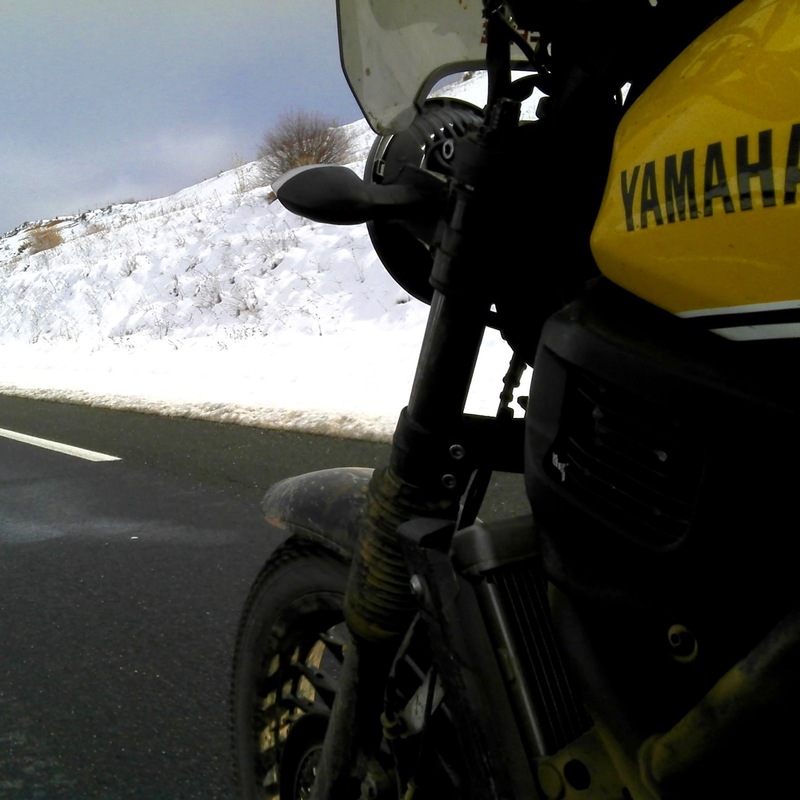 If I was heading for a really long, cold ride, I’d find a way of binding the heated jacket’s sleeves close to my arms. All these measures will enable you to run as low a setting as possible, so giving you an extra margin when things really chill down. 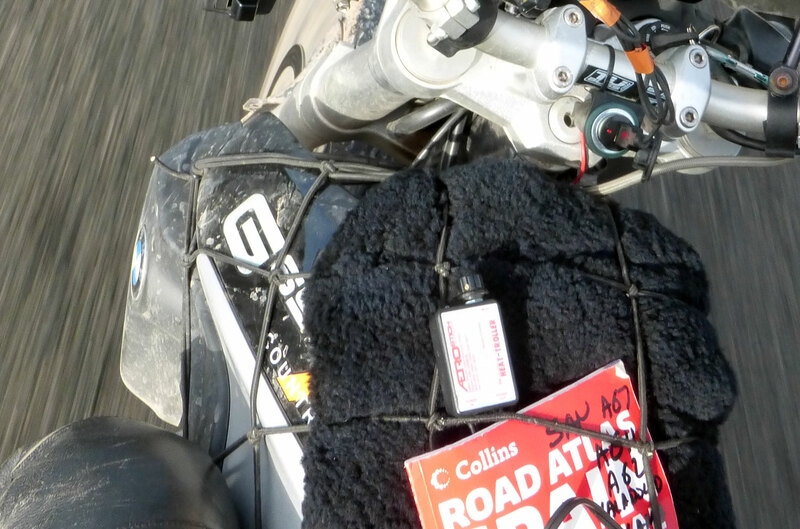 One good thing about modern bikes is they should have plenty of alternator capacity to power electrical accessories – and heated jacket liners probably make the biggest demands. My CB500X produces 500 watts at 5000 rpm – my late-80s era GS500R dished out just 200 watts at the same rpm. Even a modern 250 single might produce over 300 watts. Modern lights draw less power too, but add fuel pumps, some LED or HiD spots, heated grips as well as the possibly lower engine speeds when riding at night in freezing temperatures, and on the old GS the alternator may have struggled to keep up with the demand. These thermostats usually come as accessories to the heated liners but are a good idea unless you’re happy with all-or-nothing heating. After all, what other heating application – domestic, industrial or otherwise – has no adjustment settings? Often, as you slow down to ride through a built-up area you’ll feel too warm – you don’t want that but you may not want to switch right off either. 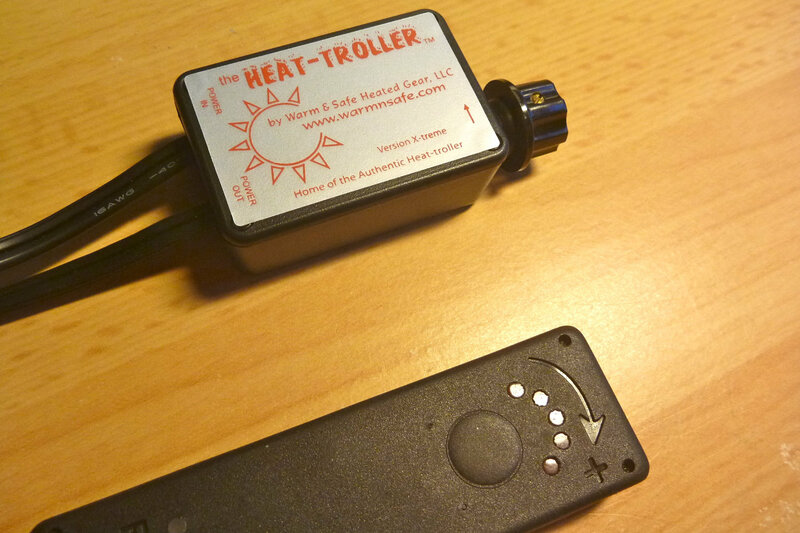 The Aerostich Heat Troller ($70; left and below right) is a little box with a dial knob and molded SAE leads. You can feel the knob’s soft click as you turn it on and in less than one clockwise turn it’s at max. Tucked down by a tank net as below right, it’s easy to operate on the move using feel alone when wearing thick gloves. No need to take your eyes off the road. I just dial it up to max then back off as needed. There’s a red LED that flashes proportionally – handy for a quick glance to see if it’s actually working or if it’s just you and you need to dial in more heat. Direct from Aerostich it seems the Heat Troller only comes with SAE connectors but I just bought one with QuiConnects coax here). Their Kanetsu jackets now comes with BMW, SAE or QuiConnect fittings. The Powerlet uses a similar black box and the co-axial QuiConnects all round (left), but with a flat pad to turn it on and keep pressing up to five levels. The problem is that pad is very hard to locate and feel through a thick glove, so you’re not always sure if you’ve done anything or gone too far and turned it off. You need to glance down to check the position of the red LEDs – not handy on an icy hairpin at six in the morning. It’s nowhere near as user-friendly as a dial knob. 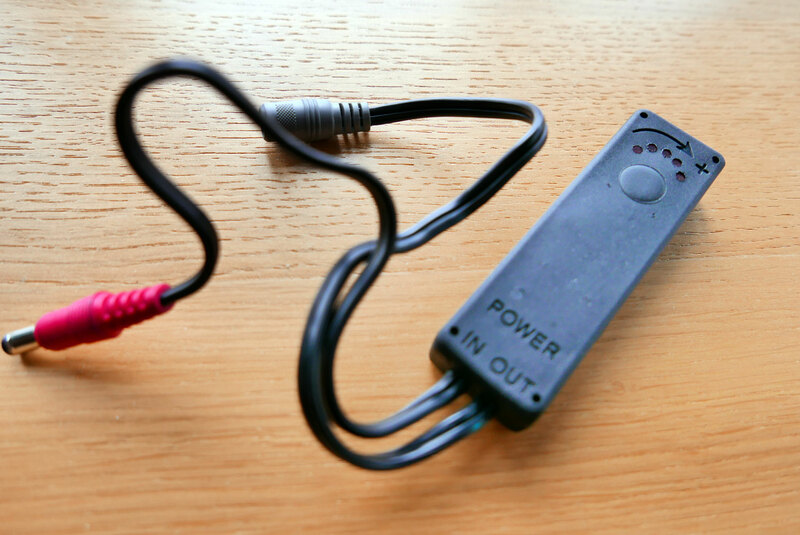 The current Atomic Skin Powerlet liner uses a remote wrist-mounted wireless controller. Me, I’d sooner fit an Aerostich-style Heat-Troller unless you mount the controller on the handlebars. Overall the discontinued Powerlet RapidFIRe gets the nod as it’s a tad less bulky, has two core heat settings, has accessory wires to run glove liners, has a regular zip for use in any riding jacket, not as a zip-in liner, has wire in the collar and slicker QuiConnect fittings. But chances are you can’t buy it any more unless you’re huge, and neither the Kanetsu not the Atomic Skin are currently sold in the UK. Don’t bother with remote, battery-powered options. Your bike has a battery and charging system: make use of them. 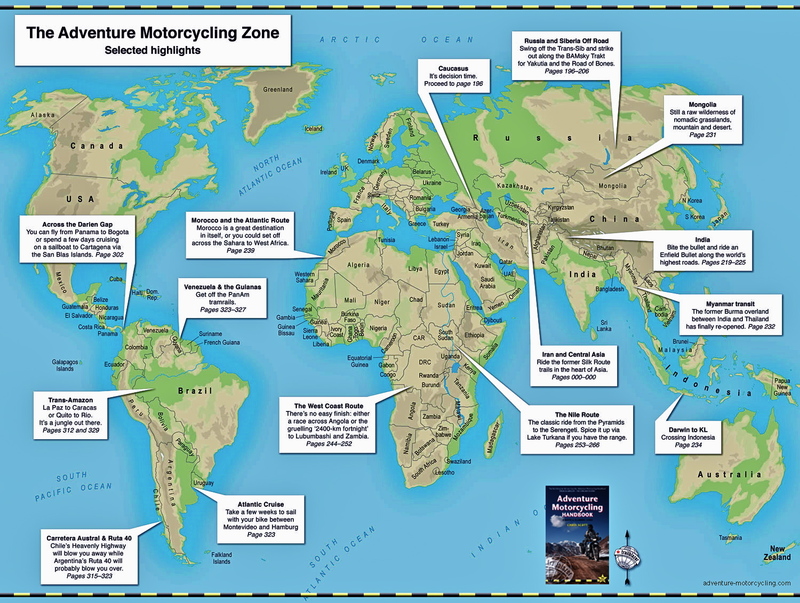 This entry was posted in Adventure Motorcycling Gear Reviews, AMH News, Jackets & Trousers and tagged 60 60 30 rule, Aerostich Kanetsu AirVantage electric liner, Arthur Brown the god of hell fire, Maurice Seddon, motorcycle heated clothing, motorcycle windchill, Powerlet Rapidfire heated jacket. Bookmark the permalink. You say ‘I remember back the late 70s there was a batty guy at work called Maurice Seddon who rode a BSA made before I was born and who sold hand-made heated clothing on the side (left).’ Maurice Seddon lived in Datchet for over 50 years but in my opinion ‘batty’ is not quite the right description. He died in 2014 but if he were here now I am sure he would admit to being an eccentric inventor. Yes there’s a nice doc on him in his house in Dachet filmed a few years before he died. To me the words ‘batty’ and ‘eccentric’ are interchangeable and were meant with affection. I write more about him in my SRY book. Thanks PH – yes, anything too thermal absorbs the heat before you get it, as I found yesterday. 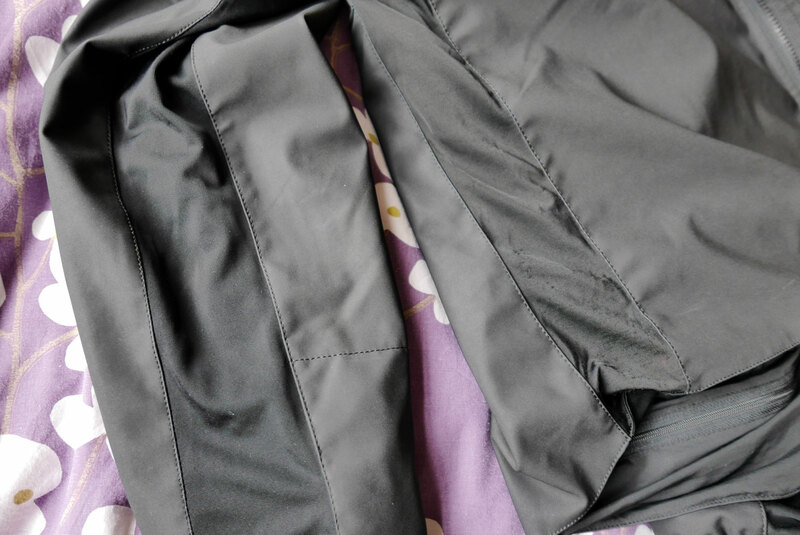 As thin as possible on the skin is most efficient – basically a long-sleeved vest you can wash. just ordered a one-dial Heat Troller and I’ll definitely be sewing up my Spandex panels to get a closer fit. I use the rapidfire with the wireless controller. This controller has dials for both the gloves and liner. (I think it’s a standard issue device and would work with your liner – I velcro it to the clutch handguard. ) The heat can be either toasty or subtle. One cold day I had it set so I felt comfortable, but felt no direct heat. So I unplugged it and , yes, I was shortly freezing. That infrared really works. You’re also right in observing that if you wear a thermal top under it, it isn’t as efficient. I bought thin form fitting synthetic tops that essentially just keep the liner off my skin – works perfectly.